What a great concept this is: fix a common audio system component matching problem with a special interconnect cable that controls how an audio source interacts with a preamplifier. I’m interested in the technical specification of a hi-fi audio product only to the extent that it supports the design rationale and explanation of the sound quality effect it has on listening experience. I rely primarily on what I hear and not measurement results, and I ask questions and investigate claims and explanations. If it sounds good or not, I want to know why. I’m familiar with the idea that impedance ‘mismatch’ can impose serious detriment on a signal by affecting frequency response in a complex way and otherwise introducing signal loss and signal/noise deterioration. If you drive a low impedance load from a high impedance source a high-pass filter is created that causes a loss of bass and dynamics as it attenuates below the circuit’s cut-off, and the attenuation varies with frequency. Also, signal loss, particularly in the bass range, increases as source output impedance approaches the input impedance of the preamplifier. The claimed sonic improvement with the Cable+ Pro in place is that details, once lost, will be fully reproduced to create a complete experience. The finest details of recordings are fully resolved, while the ‘fundamentals’ take on a new level of life and solidity. That “harsh digital sound” is replaced by a wider and more three-dimensional soundstage. I got excited by the promotional details of this product and really wanted to hear my system play music with the cable inserted, as I sensed a potential enhancement in sound quality. Looking at the website “music with and without” graphic, I intuitively understood the proposition. If that is accomplishable in my listening experience with the simple addition of an interconnect between my sources and my preamplifier, then I just had to hear the resulting soundstaging. As Burson Audio state on their website, if there is no impedance mismatch, the effect will not be significant. They helpfully and reassuringly offer a money-back guarantee – if the effect isn’t evident, then the cable is not needed. This attitude is a comfort when for far too long the sale was the end of the commitment in the minds of many sellers. Today, many buyers simply will not accept that, and enlightened and ethically-minded sellers see a sale as a fair beginning for working towards another value creation opportunity. And dare I say, again, it demonstrates real confidence in the product claims. Better to under-promise, and over-deliver, than exaggerate benefits that cannot be substantiated. Thus, as I awaited the cable, I was almost anticipating disappointment. What if I didn’t need it in my system? But no, a substantial and obvious improvement is produced with the cable inserted. The effect was immediately apparent on the first piece of music I played. I had to turn the volume down from my usual comfort setting because the dynamic range was considerably increased, with some gain! Burson Audio are well-known for their buffers, and the Cable+ Pro interconnect is a development of what has previously been available in a box, designed to control the relationship between the output impedance of a source and the input impedance of the amplifier to which it is connected, and thereby increase signal transmission effectiveness. It’s a 250k Ohm input and 3 Ohm output impedance interconnect and buffer amplifier combination, featuring Burson’s acclaimed V5 audio modules. The V5 op-amp comprises 0.5% tolerance 50 ppm metal film resistors and matched input and output FETs. This buffer circuit has a frequency response of DC to 55kHz (±1dB), a total harmonic distortion of less than 0.005%, and a signal to noise ratio better than 118dB (at 6dB gain). The circuit is shielded in a CNC-machined aluminum enclosure, and dissipates 5W (1VA) in use. 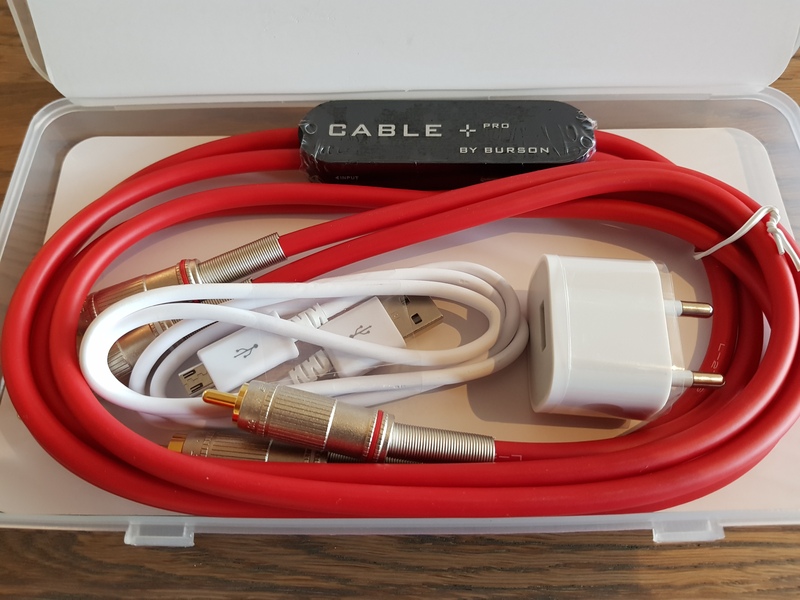 The cable is supplied in a plastic box. There is no indication of recyclability, but I could imagine reuse. I asked and was told that it is recyclable high-density polyethylene. No information was provided in the box to explain the cable/buffer function, and there was no user instructions included. That’s all on the website. Immediately apparent was that it needs to be connected to a mains power supply using the included 5V adaptor. I had not realised this from reading the promotional material that I had seen prior. With a short (900 mm) USB power cable connected at the amplifier input end of the audio cable (200mm from the audio input), this is a practical limitation to use. The unit carries a warning that failure to connect the cable in the correct direction may result in damage to it and/or attached equipment. This is because the cable incorporates an active buffer. The indication as to which way it should be connected is printed on one side of the active component, rather than on the cable. At this point, my enthusiasm for this product from a practicality point of view was waning, so music audition would be the deciding factor for me on the desirability of using it in my system. I was somewhat reassured that the cable is marked Canare L-2T2S 1605 and “made in Japan”, so it has a braided shield with metal professional grade Canare RCA plugs, and the unit is marked ‘Design & Hand-crafted in Australia.’ The 5V power adaptor resembles an Apple product, and is marked Flextronics China and ‘Designed by ipple (sic) in California’! The cable length is 1300 mm approximately, including plugs, so it’s basically a 1 metre interconnect with the active component added close to the amplifier connection. The quality of the USB power cable supplied is poor. The cover on the Micro USB plug split on first pushing it into the buffer socket! I used an alternative cable. This is a disappointment when partnered with the high quality Canare cable, and for the intended audiophile application. I also wasn’t entirely certain about the quality of the power adaptor and I enquired about battery operation, as I have seen other users talking about this option. However, mains power connection turned out to be fine, although I needed an extension to my standard USB cable. I also tried out with a Powerbank. I asked the sample organiser at Burson about battery powered operation. They told me that running it on a 5V battery will give the best results: that is, much lower background noise on the audio signal. Any typical 5V smartphone battery bank will run for days if you leave it on, or for several weeks if unplugged when not in use. After quite some time running the buffer with the mains adaptor, I swapped to an Orico Q1 Power Bank. This is rated 10,400 mAh (37.44 Wh) delivering 5V at up to 2.1A. I understand from elsewhere that a batterybank/powerbank has about a quarter of the background noise of a decent power adaptor (a linear supply may better this), but I wasn’t sure I would be able to hear a difference in sound quality. The issue seems to be the operating stability of the circuit. How did it sound on battery power? My hearing acuity is no longer good enough to discern a difference in sound quality (I’m 61 years old). With the luxury of listening for several hours a day, I got into a fourth day before the unit flaked out with an insufficiently charged battery. I also asked if the colourful with/without waveforms graphic on the website that illustrates the buffering effect of opening up the dynamics is from an actual measured test. It’s not, it’s an artistic illustration of the effect only. But it does seem plausible as that is the effect I heard – greater dynamic range and more textured detail. It’s the sonic equivalent of cleaning a thin layer of grime from the lenses of my spectacles to enable a crisp, sharp and clean vision of my surroundings. How much does the active buffer add gain to the signal? It’s a well known phenomenon that turning the volume up seems to improve the quality of audio, accounted for by the way the acuity of the ear is nonlinear and at low level some frequency sensitivity is low. I asked the provider of the sample, but didn’t immediately get a reply, so I remained unsure if some of the very apparent enhancement in sound quality was due to the increased gain I experienced right from first listening. With the Cable+ Pro in line I have had to adjust the range of travel of the volume control on my Sachém Pure preamplifier, as the input signal is clearly greater with the cable in use, due to the buffer’s amplification. I haven’t found a gain figure reported for this product, but think it’s 6dB (the figure at which the S/N is quoted). Increased dynamic range isn’t just louder, it brings greater clarity and detail, a stronger appreciation of soundstage ambience (when there is any! ), a cleaner sound with less ‘grainy’ strain along with delicacy and refinement in the upper frequencies, and more punch and weight at the bottom frequencies. I’m always consciously trying to discern what my attention is being drawn to when auditioning a system enhancement product. In this case, it’s fair and square on turning up the volume and listening longer because the music soundstaging is appreciably more engaging. Okay, since I liked what I heard, after using the Cable+ Pro for several weeks, and thus now accustomed to the sound, what if I removed it and listen some more? Would the difference be evident, and disappointing? It was like listening through a thin veil, all murky and dull, and constrained! The sound of acoustic guitar was quite lacklustre, missing depth of tone. Drums are squashed and the shimmer of cymbals subverted, and bass guitar subdued and weakened in the soundstaging. Timbre was lacking something, being less natural, more coloured. Fine details and tonal character of instruments were submerged or suppressed. Overall, the vitality and sparkle of the soundstage presentation was diminished appreciably. The music’s just not as interesting when staged less dynamically. My Sachém V2 power amplifiers are characteristically fast and clean. That’s what attracts me to using them. They showcase highly dynamic recordings. This is so noticeably lost when the Cable+ Pro isn’t in the system to work it’s simple matching magic. I reckon the enhancement is so apparent in my system because it’s doing just what the makers claim. I checked the input spec for my Sachém Pure preamplifier. It has an input impedance (referred to the IC) of 5 x 1011 Ohm (that’s 500,000 M Ohm, effectively infinite), and the output of my in-line iTube tube preamp/volume control (input impedance 1M Ohm) is less than 160 Ohm into the Cable+ Pro input of 250k Ohm, which outputs just 3 Ohm to the preamplifier. My phono preamp outputs at 50 Ohm. Pioneer didn’t provide an output impedance figure for my PD-D6 SACD player, and I can’t find figures for my RPi-based media players. I reckon they are of the same order. Low out impedance into very high input impedance seems to be the magic combination. I asked again for an explanation of the impedance matching from Burson Audio. I was latterly told that the weaker the output signal, the higher its output impedance. Such a signal from an audio source puts strain on the amplifier. An impedance mismatch prevents the audio amplifier from performing at its best. The Cable+ Pro audio buffer strengthens the output signal from the source. As the strength of the signal improves, its output impedance also lowers. When this stronger signal is fed to the amplifier, the amplifier can perform at its potential. I’m not an audio electronics engineer, so that’s the best I can do to explain technically why this product works, and indeed there is talk amongst enthusiasts that so-called ‘impedance mismatch’ is not a real problem, and that ‘buffer’ is a misnomer for a circuit of this kind. 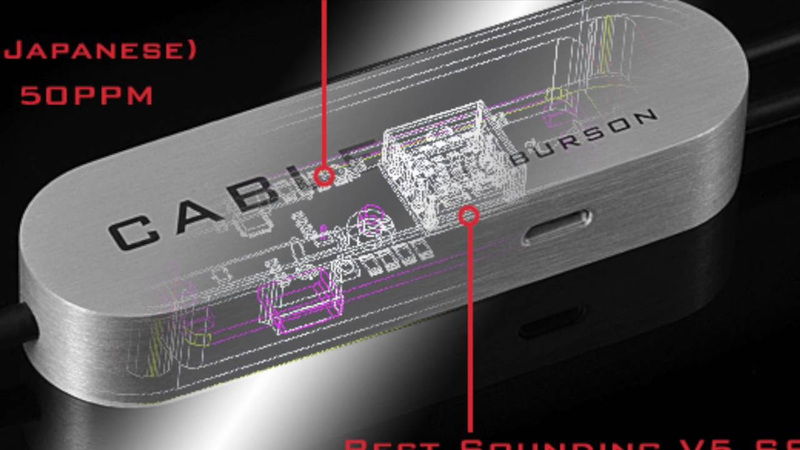 I’m also aware that Burson Audio had some controversy over impedance matching 10 years ago with an earlier audio buffer product (The Burson Audio Buffer). However, I enjoy the clear and significant enhancement to the sound quality from my system. 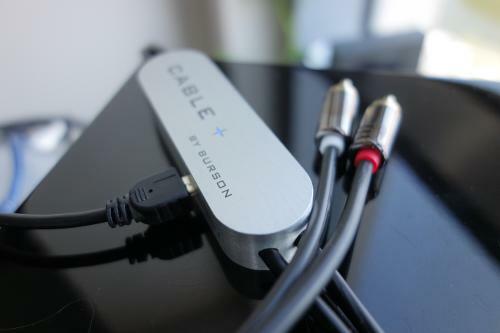 That’s enough reason to give a big thumbs up from me for the Burson Cable+ Pro. 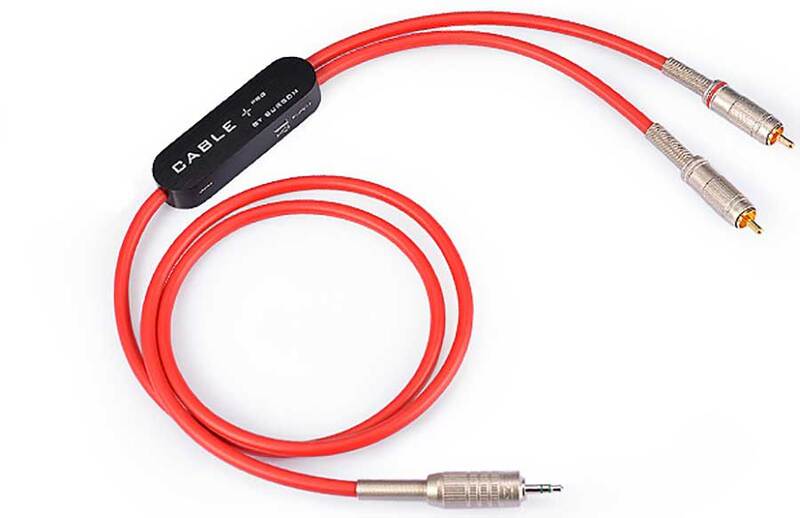 * The Burson Cable+ Pro Active Buffer Cable is available for US$199, inclusive of shipping.